English Premier League Analysis: How much does the “LITTLE HORSE” cost? Jose Mourinho said “Two horses and a little horse in the race”. Manuel Pellegrini responded “Little, but Rich horse”. Are they joking? Managers of two heavy weight teams formed on millions of pounds are fighting over Financial Mediocrity! Let’s figure out the real scenario by analyzing the cost incurred in assembling the Premier League top 7 clubs. RED DEVILS SQUAD IS COSTLY TOO: Manchester United squad players (12.04 m Pounds per player) costed them almost twice more than Tottenham (7.74 m Pounds per player), Arsenal (7.25 m Pounds per player) & Liverpool (6.36 m Pounds per player) players and 6 times Everton squad players’ (2.71 m Pounds per player) average cost. They can’t afford to lose Champions League spot with such a rich squad. 1. Youth Development Pro Clubs: Arsenal and Liverpool are showing a more interest in the development of young players through youth academy than their peers. 2. 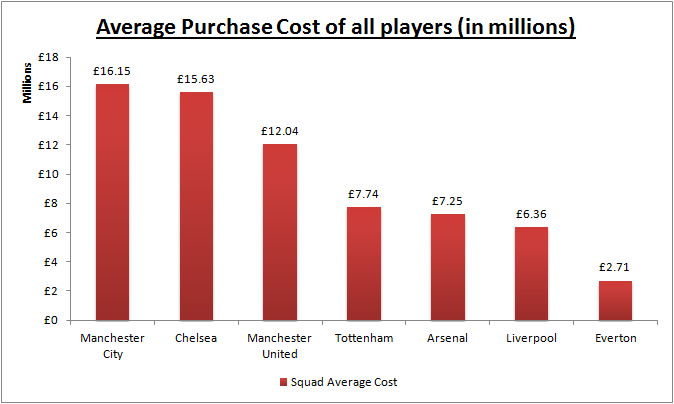 Chelsea spent money equally for Bench players and Main XI: Though Chelsea stands second in terms of overall squad average cost, they stand first in terms of average cost of players in bench. 3. 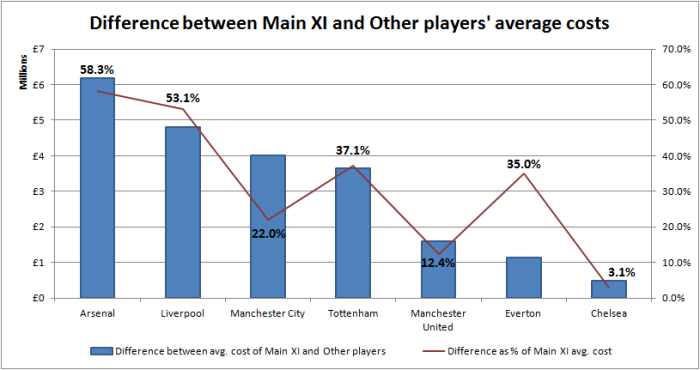 High risk of losing main XI players: Arsenal, Liverpool, Tottenham and Everton are the clubs which have high disparity between the main XI and the rest of the squad. 1. 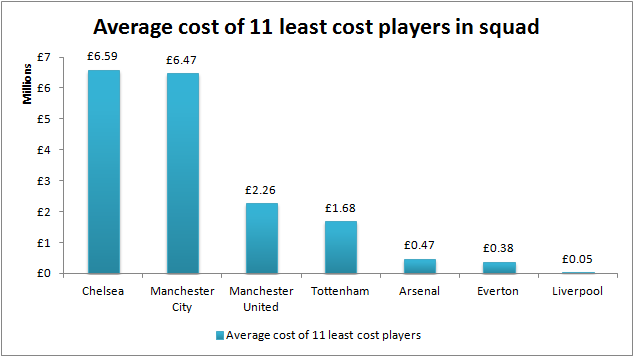 Chelsea and Manchester City squads’ least cost 11 players cost more than Liverpool’s average cost of the overall squad. 2. Liverpool, Everton and Arsenal have more players signed from youth academy or on loan relatively. 3. Manchester United’s least cost 11 players cost almost the same as Everton’s average cost of overall squad. If average player cost were to be used as a proxy of player quality, then Chelsea and Manchester City have the strongest bench, while Liverpool the weakest among the top seven clubs. 2. Strangely, the leaky Manchester United defense has the highest cost spent player across the top 7 clubs. 3. Manchester City, Tottenham Hotspur and Liverpool have spent very high cost per Forward than per Midfielder. 4. 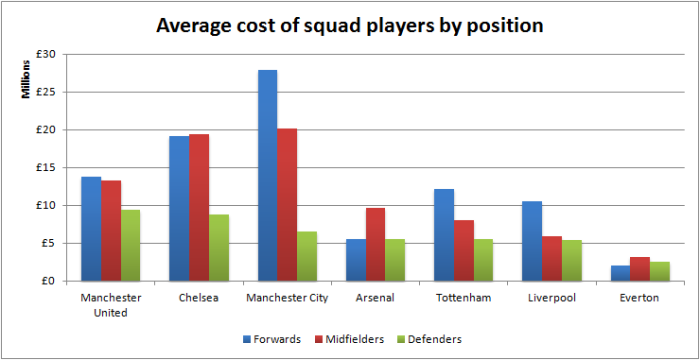 Arsenal have forwards and defenders with almost same cost per person. 5. Arsenal’s forwards cost much lesser than Manchester City, Chelsea, Manchester United, Tottenham and Liverpool. Wow! This article is purely looking at football transfers like how you would buy groceries. I don’t know if the editorial team team thinks that any number based analysis on an offbeat topic is all management-esque.